Extreme Sailing Series – The Wave, Muscat staged a valiant comeback to score a resounding win in the final double points race in Qingdao which hoisted them to second place overall with Oman Air coming in four places behind. More testing conditions in Fushan Bay, with zero to moderate winds spiced up with massive shifts and the occasional but vicious 30 knot gust, confounded the entire fleet. Teams were timed out when the wind died before they could finish and the leaderboard paraded four different winners in five races. 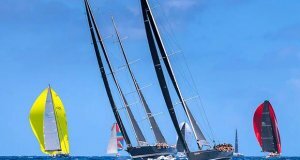 Leigh McMillan and his crew of Pete Greenhalgh, Sarah Ayton, Nasser Al Mashari and Ed Smyth went into the final day in fourth place but by the last race had closed the gap sufficiently to be in with a chance of reclaiming their China crown. They needed the double points for a win and for leaders SAP to come last and while they achieved the first, SAP crossed the finish line in third place to earn their first victory of the series. “We knew we had a sizeable job to do today because we had a challenging day on Saturday and lost a lot of points,” McMillan explained. “We had one race that went badly for us when we were in a good position but luckily, we didn’t let our heads go down. It was great to win the double pointer and jump two places into second. Despite his time spent in Qingdao in 2008 competing for Britain in the 49er class at the Beijing Olympic Games, Oman Air skipper Stevie Morrison admitted the ‘crazy’ conditions got the better of him and his crew of Ed Powys, Nic Asher, Ali Al Balushi and Ted Hackney. “It was tricky here – crazy winds coming through the skyscrapers and we couldn’t predict what was going on so we need to work out what lessons we take away from here,” he said. 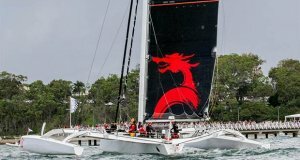 Both Oman Sail teams are now looking ahead to Act five in Cardiff, UK next month, according to The Wave, Muscat’s bowman Nasser Al Mashari, who said they were pleased with the team’s performance in China. “The racing in Qingdao was very difficult with the strong winds,” he said. Morrison too was already planning his first trip to Cardiff, a city centre venue renowned for being small and tricky with light and gusty winds. The trip to Qingdao will be etched on the memories of Morrison’s crew since the visit coincided with the announcement that their team sponsor Oman Air is Official Airline to the Extreme Sailing Series and that China is to become their 49th destination as part of the growth of their network around the world.